Recent cold fronts have pushed more sparrows into the area. Song Sparrows, like the one above, are present year-round, but in the last couple weeks, I have been seeing a lot more of them than usual. Some of that is probably post-breeding dispersal (yesterday I saw one that looked very young! ), but migrants are surely part of the influx. Yesterday I also saw my first White-throated Sparrows of the fall. I thought I had heard some calling (with their soft chip notes) once or twice before, but I had not gotten a visual confirmation. Outside my bedroom window there is a line of crabapple trees, and close by, there is an eastern red cedar. Both tree species are fruiting heavily right now, and birds are taking advantage of the bounty. Yesterday afternoon I noticed a lot of bird activity in those trees, so I took some time to photograph birds through my window. First off, this European Starling seemed especially fond of the cedar berries. When I have seen birds eating berries from that tree in the past, they have mostly been House Finches, so the starling's interest came as a bit of a surprise. This individual is interesting for another reason as well. 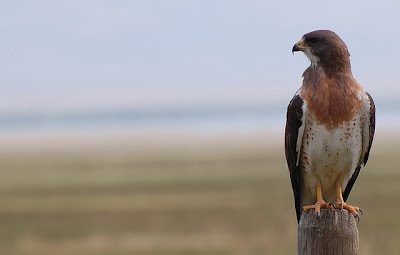 It shows feathers from two different plumage stages, juvenile (the brown patches on its head) and formative or first basic (the white-spotted body feathers). House Sparrows were part of the crowd. How often do you get to look down at birds sitting in a tree? Northern Cardinals were also present, though they seemed more interested in the feeders behind the house than the crabapple fruits. Last but not least, this American Redstart was a bit of a surprise. I have been seeing them around, in the yard and further afield. This was something of a lucky shot, too, as I only had time to take two photos before it moved on, and the first was affected by motion blur. Unlike most of the other birds, redstarts are primarily insectivores, so it would have been drawn by whatever insects were in the trees rather than the fruits. Yesterday was the 50th anniversary of the publication of Silent Spring by Rachel Carson — a book that linked the use of synthetic pesticides to the disappearance of many formerly common birds and sparked the modern environmental movement in the process. There are numerous tributes and reactions across the web. Here are a few: Silent Spring after 50 years (RRBO), Listening to nature (Smithsonian), 50 years on: Rachel Carson’s “Silent Spring” (Why Evolution Is True), Rachel Carson Didn’t Kill Millions of Africans (Slate), How ‘Silent Spring’ Ignited the Environmental Movement (NYT Magazine), and How Rachel Carson Spurred Chemical Concerns by Highlighting Uncertainty (NYT Dot Earth). Scientists in British Columbia attached geolocator backpacks to birds from two subspecies of Swainson's Thrush to track their migratory movements. One subspecies traveled south along the West Coast to Central America, while the other flew southeast to the Gulf Coast and on to Colombia. Mongabay.com interviews Pablo Garcia Borboroglu, the President of the Global Penguin Society, on the conservation challenges facing the 18 extant species of penguins. More than half of all penguin species are threatened with extinction, with climate change and overfishing playing prominent roles. Researchers found that Eurasian Jays use flexible strategies in storing food and raiding other jays' food caches; social status and proximity of other jays factor into which strategy is used. A study of Caribbean bullfinches found that different species used different genetic paths to similarly-shaped bills. Spotted Antbirds on Barro Colorado Island in Panama forage almost exclusively around marching columns of army ants, unlike their mainland counterparts that mix foraging near army ants with finding food on their own. The change in behavior seems to be linked to the recent disappearance of Ocellated Antbirds from the island. Dredge spoils from Rincon Channel, which serves the port of Corpus Christi in Texas, are being used to increase nesting habitat for terns and Black Skimmers. A Golden Eagle that had been fitted with a satellite transmitter for research purposes was killed by a trap in Scotland. Malabar Pied Hornbill is one of the many bird species that can be seen on Sri Lanka. March of the Fossil Penguins: Killer Bobble-Headed Penguins! Myrmecos: A Cretaceous Haidomyrmex as the first trap-jaw ant? Painting rooftops white can lower the urban heat island affect, but it can also reduce rainfall, which may be a significant disadvantage in some areas. A genetic study of urban coyotes in Chicago found complete monogamy, which is unusual among animals adapted to cities. The National Park Service is testing 96 employees who worked at Yosemite National Park for hantavirus infections. One historian noted the irony of a hantavirus outbreak happening at a national park that was originally envisioned as a place of healing. The IUCN is creating a green list of fully protected species and ecosystems to complement its red list and promote conservation success stories. Washington's decision to kill one of its wolf packs has ignited significant opposition. A priest is under investigation for ivory smuggling in the Philippines. His role was brought to light by an article on the global ivory trade that appeared in National Geographic recently. Religious images (in the Philippines and elsewhere) remain a major market for smuggled ivory. Salt marshes sequester large amounts of carbon, but rising sea levels threaten their continued existence. Yesterday morning I birded the Heathcote Meadows complex near Kingston, New Jersey. One of the more interesting sights was a series of Eastern Phoebes lined up along the fence surrounding the old plant nursery buildings. There were at least four, maybe more, flicking their tails and swooping down to catch insects near ground level. One even sat in the grass for a moment before flying back up to the fence. (One of them is shown above.) While I was still in the same field near the buildings, a Merlin (my second of the season) flew overhead at about treetop level. It seemed to be actively hunting rather than migrating. There were fewer warblers than I expected, but I was pleased to see a Blue-winged Warbler among them. Scientists tagged 25 Atlantic Puffins that breed in Ireland with geolocators that will track where they spend their winter. A previous study of puffins from the North Sea found that they spent the winter in the Atlantic Ocean. Climate change is likely to ease the northward spread of avian malaria, which could devastate Arctic bird populations that lack immunity to the pathogen. Avian malaria was recently discovered in bird populations near Anchorage and Fairbanks in Alaska. A study of New Caledonian Crows suggest that the crows are able to reason cause and effect, even when the cause is hidden. Surveys of Brazil's state of Acre found that the region is home to numerous rare and endangered bird species, even though it is rarely visited by birders. Results of the surveys are published in Tropical Conservation Science (pdf). On Saturday, Heinz National Wildlife Refuge hosted its annual Cradle of Birding festival to celebrate its status as the most urbanized wildlife refuge in the US. Some observers have reported seeing European Hornets attack hummingbirds. BugBlog: Are male false widow spiders ant mimics? In 2011, the US generated 14 million megawatts of electricity by burning trash, mostly along the east and west coasts. This output places waste energy on equal footing with geothermal energy. Coral diversity around Madagascar and elsewhere in the Indian Ocean rivals that of the Great Barrier Reef. Climate change is causing warmer water temperatures in the Atlantic, which is prompting fish to shift their ranges northward, out of US waters. Scientists in Tennessee have built an artificial bat cave that they hope will help limit the spread of white-nose syndrome. New Jersey scientists are testing ways to reduce the numbers of invasive Brown Marmorated Stink Bugs, an indoor pest in the fall and winter and an agricultural pest during the growing season. Arctic sea ice reached its annual summer minimum on September 16 and set a record low in the process. The gradual disappearance of Arctic sea ice (along with the possibility of future ice-free summers) has set off a race to extract the Arctic Ocean's mineral resources. Meanwhile, Dutch Royal Shell has had to cancel its plans to drill in the Arctic this year because of a series of mistakes. A conservation effort is focused on saving endangered mountain yellow-legged frogs in California. This Green Heron was in a shallow pond behind Morgan Mudflats. Shortly before I took the photo on top, the heron caught and ate a frog (seen below). I am not sure what type of frog it is. My guess would be Green Frog, since those are so common, but a few other species might be present there. A 73-year-old birder was raped and beaten in Central Park this week. The assailant has been arrested, but the brutality of the attack has left the park's birding community uneasy. Brown Treesnakes have reduced the numbers of birds on Guam, whose absence has in turn increased the number of spiders. Crows use similar parts of the brain to remember familiar faces as humans do. Bird diversity is at risk if shade plantations and forests are converted into open farmland. Scientists are using radio transmitters to track social networks in New Caledonian Crows, in order to see if social networks transmit information about sophisticated tool use. A five-year research project is evaluating the breeding population of Kittlitz's Murrelets. The study may result in placing the species on the Endangered Species List. March of the Fossil Penguins: Fossil penguin…. poop? The continued progress of climate change means that the new USDA plant zones map is already out of date. A German monk was found naked and disoriented in the woods after he mistakenly ate the berries of a Deadly Nightshade plant. While many wild plants and fungi are edible, this should serve as a reminder not to eat plants if you are uncertain about their identity. A new monkey species called the lesula has been discovered in the Democratic Republic of Congo. The IUCN has created a list of the world's 100 most endangered species. This summer was the 3rd-hottest in US history. A man was arrested for trying to smuggle lorises in his underwear. Researchers in New Jersey are trying to revive American Chestnut trees, which were decimated by blight in the 20th century. A ninth person has been infected with hantavirus linked to cabins at Yosemite National Park. Last Saturday while I was off birding elsewhere, Vincent Nichnadowicz discovered a Crested Caracara in a field at Grover Farm, a historic preservation site in West Windsor, New Jersey. The bird stuck around, and since then numerous birders have gone to see and document it. Yesterday morning I finally had a chance to see it. Getting there took more than twice as long as it should have, as traffic on US 130 was backed up for miles because of a truck accident that shut down the New Jersey Turnpike. By the time we got to the site, the caracara had already left its overnight roost on a utility pole and was foraging on the ground in a depression on the far side of the field. Its head was just barely visible above the alfalfa. Eventually it did move around a bit more as it foraged. Several times it stopped walking to pick at something on the ground with its bill. Most of its body became visible when it walked up on the small rise in front of the depression, which allowed for more complete views of the bird and (relatively) better photographs. I think the one above is the best of the ones I took. In it, you can see the caracara's distinctive facial features — the orange base of its hooked bill, the black cap and crest, and the white face and neck. The tail banding is also visible. In the hour and a half that I watched it, I never saw it fly. This was the 300th bird species I have seen in New Jersey. Several other birders were present yesterday morning, including two who had driven down from New York City. Crested Caracara is not a regular visitor to New Jersey. This species is normally found much further south, in southern Florida, the Caribbean, Texas, and south through Mexico, Central America, and northern South America. It prefers arid or semiarid open habitats, such as brushland or agricultural areas. There are two other caracara species from which it was recently split: Southern Crested Caracara and Guadelupe Caracara (the latter now extinct). Caracaras are placed within the family Falconidae. Unlike other falcons, they run after prey on the ground and scavenge instead of pursuing birds in the air. Caracaras will feed on carrion or garbage if those are available; otherwise they prey on a variety of small animals like rodents, amphibians, reptiles, and invertebrates. When they hunt on foot, they use their feet to turn over objects that might conceal prey. This is not the first time a Crested Caracara has been reported in New Jersey, but it is still a potential first state record. Bill Boyle's Birds of New Jersey (which I reviewed here) mentions two previous records, neither of which was accepted by the New Jersey Bird Records Committee. The first was in Colonia in 1976 and was so tame that birders assumed it had escaped from captivity. 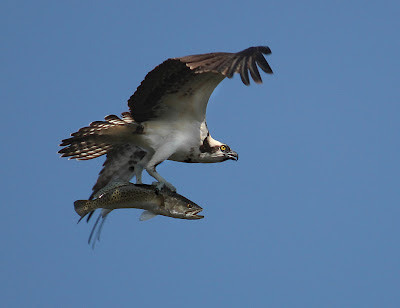 The second was seen at Sandy Hook on May 5, 2007. In both cases, the NJBRC rejected the records because they were unsure if the birds were actually wild. Historically, Crested Caracara was considered a sedentary species, unlikely to travel much beyond its normal range. However, as Nate Swick and various commenters discuss on the ABA Blog, there have been enough sightings of the species across the continent in recent years to suggest that caracaras may be more prone to vagrancy than previously thought. Some local birders are speculating that this individual was blown north by the remnants of Hurricane Isaac. That may be true, or it may have flown here under different circumstances. Many birders from the area are seeing and documenting this bird's appearance and behavior so hopefully we will have a clearer idea of this individual's status than the previous two sightings. Yesterday morning my friend Anthony picked me up for a morning of birding. Our first stop was a field in Cranbury that he discovered was one of the few reliable spots in Middlesex County for grasspipers and other denizens of plowed agricultural fields. The site itself is rather nondescript, down a side road next to an office park. When we arrived, a tractor was plowing the opposite side of the field, which initially caused some concern that it might spook the birds away. However, out target species were there. Anthony found about a dozen Horned Larks among the weeds in one of the unplowed furrows. The Horned Larks, in addition to being a county bird, were my 2,000th county tick* in New Jersey. Soon after, three American Golden-Plovers, another county bird for me, turned up further back on the field. In addition to the two target species, some Killdeer and Least Sandpipers were using the field. At one point, the sandpipers flushed, and we could see a larger and chunkier sandpiper among them. Unfortunately, the larger sandpiper flew over the far treeline instead of landing back in the field. Having seen our target birds in Cranbury, we headed off to Sandy Hook to look for an Elegant Tern that was reported there earlier in the week. Elegant Terns normally reside on the Pacific Coast, particularly around Baja California and the Sea of Cortez. About 90-97% of Elegant Terns nest on a tiny island about a third of the way down the Sea of Cortez. 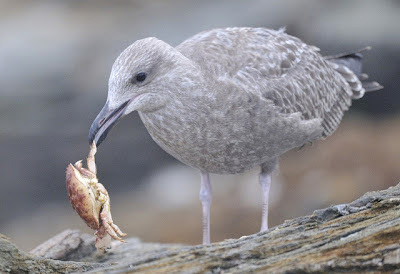 They are frequent vagrants, but infrequent visitors to the Atlantic Coast. This bird was the first Elegant Tern recorded in New Jersey. Other eastern records have come from Texas, Florida, Virginia, and Massachusetts. We arrived at Sandy Hook at the same time as a thunderstorm, so we sat in the car to wait it out. When it stopped raining, we started out along the Fishermen's Trail. At the end of the trail, another downpour started, so we huddled under Anthony's umbrella until it passed, which was not long but long enough to make sure that our legs and feet got soaked. While we were waiting we saw a few Black Terns that braved the storm in among the far more numerous Common Terns. After we had followed the curve of the beach past the tidal cut, another birder signaled that he had the Elegant Tern and gave us a look through his spotting scope. In the photo above, it is the larger tern just beyond the Black Skimmer. The narrow, pointed bill was fairly obvious; the difference between this bird's crest and a Royal Tern's slightly less so. We looked for but did not find the Buff-breasted Sandpipers and Baird's Sandpiper that have also been reported from that area. A brief walk through the Scout Camp area turned up two very early Dark-eyed Juncos and a Palm Warbler. On the way back from Sandy Hook, we stopped at Morgan Mudflats, but there was not much activity. The tide was high enough to cover the spit, so the only terns we saw were two Royal Terns in flight. At the end of the trail from the cul-de-sac there was a Green Heron in bad condition. An immature Cooper's Hawk was alternately chasing and being chased by a gang of American Crows. At that point we wrapped up a very good day of birding. * County ticks are the sum of each county list in the state, i.e., a bird species counts once for each county it is recorded in. I would be unlikely to keep that tally myself, but luckily, eBird keeps it for me. Using GPS receivers, scientists have gained some insight into how albatrosses are able to fly so efficiently with the use of four-step soaring cycles. The research was published in PLoS ONE. A columnist writes about the harassment and violence that have accompanied the ORV regulations on North Carolina's Cape Hatteras National Seashore. Scientists are investigating whether mate choice among Magellanic Penguins depends on the presence of genes that help resist disease. One wind energy company based in New Jersey is trying to redesign wind turbines to reduce bird and bat fatalities. The new turbines have internal blades that turn and produce energy when wind is compressed through a cone. The recently discovered Antioquia Wren and the threatened Military Macaw will lose habitat if the Pescadero-Ituango hydroelectric dam is built in Colombia. Oil leftover from previous spills (including BP's 2010 spill) has coated several birds on the coast of Louisiana. When a Western Scrub-Jay dies, other jays gather around its body and vocalize, seemingly to mourn their dead companion. Describing this activity as a "funeral," however, probably goes a bit too far. 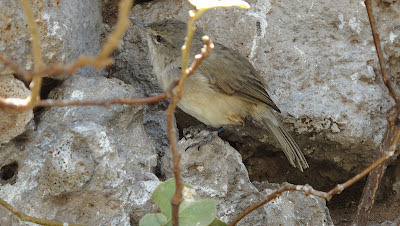 Scientists are trying to restore Millerbirds to Laysan Island in Hawaii through a capture and translocation project. The British Trust for Ornithology is asking birders to monitor what sorts of berries birds eat in their gardens. South Jersey Butterfly B/Log: Southbound & Historic? American presidential candidates Barack Obama and Mitt Romney answered 14 questions on science and technology policy, some of which touch on environmental issues. Speaking of the presidential campaign, both parties have largely avoided the issue of climate change at their conventions, with Bill Clinton and Barack Obama being among the few speakers to refer to this major problem. Democrats have backtracked significantly on climate change from their positions in 2008 and continue to support bad solutions like "clean coal," while Republicans remain stuck in climate change denialism. The New Jersey Department of Environmental Protection is planning drastic changes to Bull's Island, including the clear-cutting of a large but unspecified number of mature sycamore trees. Bull's Island was historically a nesting site for Cerulean Warblers and continues to be a nesting site for other uncommon bird species. (See also the discussion on Bill Wolfe's blog.) To speak out against this change, please sign this petition. Hurricane Isaac churned up oil and tar balls left over from BP's 2010 spill following the Deepwater Horizon explosion. Louisiana has closed 12 miles of beaches in response until the oil is cleaned up. Scientists have created remote-controlled cockroaches. Franciscan manzanita has been added to the federal endangered species list. Until recently, the species was thought to be extinct, until it was discovered growing on a traffic island near the Golden Gate Bridge. The plant was moved to the Presidio, and it remains the only known specimen of the species. Here is a close-up of its flowers. Multiple pilot whales have stranded off the coast of Scotland, and several of them have died subsequently.